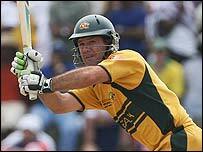 Ricky Ponting top-scored with 86 off 106 balls for Australia as England were beaten by seven wickets in Antigua. Adam Gilchrist and Matthew Hayden had laid the foundations for Australia with an opening partnership of 57. Ponting shared a third-wicket stand of 112 with Michael Clarke (55 not out), who saw them home with the big-hitting Andrew Symonds (28 not out). Earlier, Kevin Pietersen hit his first World Cup century, making 104 off 122 balls, in England's total of 247. Ian Bell opened the innings after Ed Joyce was left out, and made 77, putting on 140 for the third wicket with Pietersen - but Ravi Bopara was the only other England player to reach double figures. The last 20 overs of England's innings was the critical period. When Pietersen and Bell took the score to 164-2 in the 30th over, England looked set for a score of around 300. But Australia's top three seamers bowled superbly well in the latter overs, and Pietersen and the lower middle order were frustrated into hitting singles or throwing their wickets away. Michael Vaughan chose to bat first after winning the toss on a glorious morning in Antigua and he edged the first boundary through the slips. But the England captain's wretched form with the bat continued as he played on to his stumps off the lively Shaun Tait, as did the recalled Andrew Strauss soon afterwards. Pietersen, now ranked as the world's top one-day batsman, got off the mark with an impressive straight-driven boundary off Tait, while Ponting introduced Clarke's left-arm spin into the attack, perhaps to tempt Pietersen to hole out. But Bell looked confident, cracking Glenn McGrath for three fours in the 14th over, and Pietersen then advanced down the track and hoisted Clarke to long-on for six, while the fifty partnership came up off just 55 balls. With injured all-rounder Shane Watson replaced by batsman Brad Hodge, Australia were lacking an out-and-out fifth bowler and chose to delay taking the third powerplay. 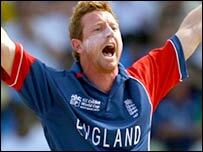 But Ponting's decision eventually bore fruit as Tait and Brad Hogg frustrated England in mid-innings. Bell and Pietersen eventually reached their fifties in the 23rd over, with Pietersen's coming off 49 balls and Bell's from 69. Pietersen was then dropped by Ponting at mid-wicket off Symonds and a mixture of orthodox and improvised strokes took them past a century partnership. Pietersen had another 'life' when he lofted Tait to deep mid-off where Matthew Hayden, running back, let the catch spill through his hands. Bell eventually succumbed when he drove McGrath to Mike Hussey at cover for an impressive 77 off 90 balls that justified his elevation to the top of the order. His replacement Paul Collingwood followed soon after, edging Tait to wicket-keeper Gilchrist for the paceman's third wicket of the innings. The out-of-touch Andrew Flintoff was then undone by Hogg, who took 1-36 in an economical mid-innings spell, when he advanced down the crease to the wrist-spinner and was easily stumped by Gilchrist. Pietersen, then on 71 not out, was joined by Bopara, who was fresh from his Man of the Match knock in the narrow defeat by Sri Lanka and batted sensibly for his 21. The pair's fifty stand came up off 62 balls, before Bopara lifted Nathan Bracken to Hussey on the midwicket boundary. Paul Nixon did his best to give Pietersen the strike as he reached his century off 117 balls, but he was eventually dismissed when he lofted Bracken to Michael Clarke at long-off, for 104, having hit six fours. Although Nixon hoisted a lusty blow for six over long-on off McGrath, he and the rest of the order crumpled quickly as Australia wrapped up the innings with one ball to spare. Bracken, McGrath and Tait all picked up three wickets - and the expectation was that England had not made best use of the conditions. Left-handers Gilchrist and Hayden had few problems against the opening seam attack of James Anderson and Sajid Mahmood, although Gilchrist was inches away from getting an inside edge to Anderson in the first over. He then survived a strong lbw shout from Mahmood, before blasting the same bowler for three boundaries as the opening pair comfortably put together a half-century stand. Gilchrist's participation ended with he again fell to Flintoff bowling round the wicket - popping an easy catch to Collingwood at point, while Hayden remained, hitting six fours. Medium-pacer Collingwood made an immediate impact with his first ball as he clipped Hayden's off-stump, and appealed for lbw until umpire Rudi Koertzen told him that the Australian opener had in fact been bowled for 41. However, England missed a good chance to run Ponting out when Vaughan's wild throw from mid-wicket missed the stumps with Ponting struggling to make his ground. The imperious Australian captain dominated the English bowlers, although he struggled to time the ball on occasions as Vaughan tried to keep the field tight. But Mahmood was singled out for particular punishment, with Ponting bludgeoning 12 off the 30th over, which also yielded a wide as the Aussies reached 147-2 with 20 overs remaining. Another quick single by Ponting was referred to the third umpire after Strauss hit the stumps at the bowler's end, but the captain had easily made his ground as he and Clarke eventually put on 112 for the third wicket. Vaughan rotated his bowlers but it was another misjudged run which saw Ponting's demise as he pushed forward to Flintoff, was sent back by Clarke, and Collingwood's fizzing throw from backward point threw down the stumps at the striker's end. "The act of making the catch shall start from the time when a fielder first handles the ball and shall end when a fielder obtains complete control both over the ball and his own movement"
Symonds was in no mood to hang around, hoisting Collingwood to the cow corner boundary for four - and then was nearly caught there by Pietersen on the following delivery. Pietersen got both hands to the ball just inside the boundary, and appeared to hold the ball for four or five steps before throwing it away when he realised he was about to step over the rope. But after a referral to the third umpire, the Queenslander was given not out, and celebrated by hoisting Collingwood over long-off for six the following ball. There were no more concerns for Symonds and Clarke as an unbroken stand of 47 all but confirmed Australia's place in the semi-finals - and Symonds ended the game with 16 balls to spare with a pull to the mid-wicket boundary.